Evaporation: This is the change of water from a liquid to a gas. On average, around 47 inches is evaporated into the atmosphere from the ocean each year. Transpiration: This is the evaporation of liquid water from plants and trees into the Earth’s atmosphere. Nearly all water that enters the roots transpires into the atmosphere. Sublimation: This is the process where ice and snow (a solid) changes into a gas without moving through the liquid phase. Condensation: This is the process where water changes back into a liquid. This is when we begin to first see clouds. 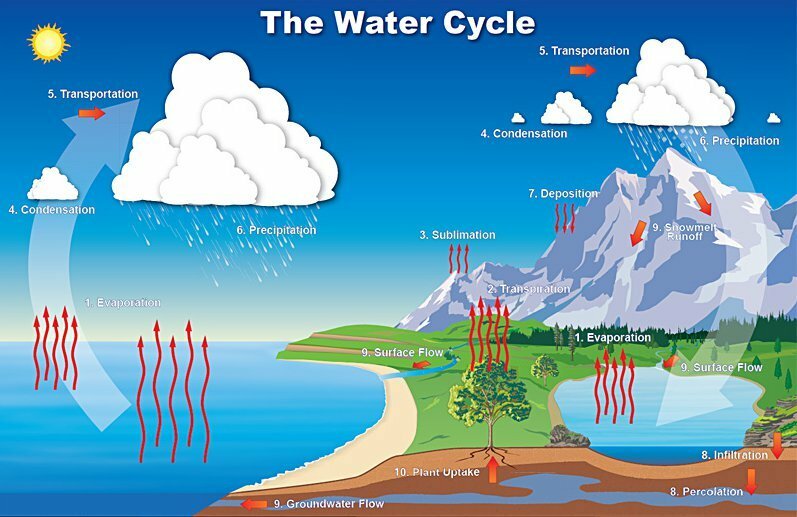 Transportation: This is the movement of solid, liquid and gaseous water throughout the atmosphere. Without this movement, all of the water evaporated over the ocean would not precipitate over land. Precipitation: This is water that falls to the earth. Most precipitation falls as rain but includes snow, sleet, drizzle and hail. On average, about 39 inches of rain, snow and sleet fall each year around the world. Deposition: This is the reverse of stage 3. Water vapor (a gas) changes into ice (a solid) without going through the liquid phase. This is most often seen on clear and cold nights when frost forms on the ground. Infiltration: This is the movement of water into the ground from the surface. Percolation is movement of water past the soil going deep into the groundwater. Surface flow : This is the river, lake, and stream transport of water to the oceans. The water may return to the surface in springs or eventually seep into the oceans. Plant uptake: This is water taken from the groundwater flow and soil moisture. Only 1% of water that a plant draws up is used by the plant. The remaining 99% is passed back into the atmosphere. Water is a vital part here on Earth, and on World Water Day this Thursday, let’s not forget the importance of clean drinking water for you and your loved ones. At Filters Fast, we offer a variety of water products to help ensure you of clean drinking water. From the Zero Water Cooler Bottle Filtration System to the� Everpure Water Filtration System, Filters Fast knows the importance of clean, drinking water for you and your family.